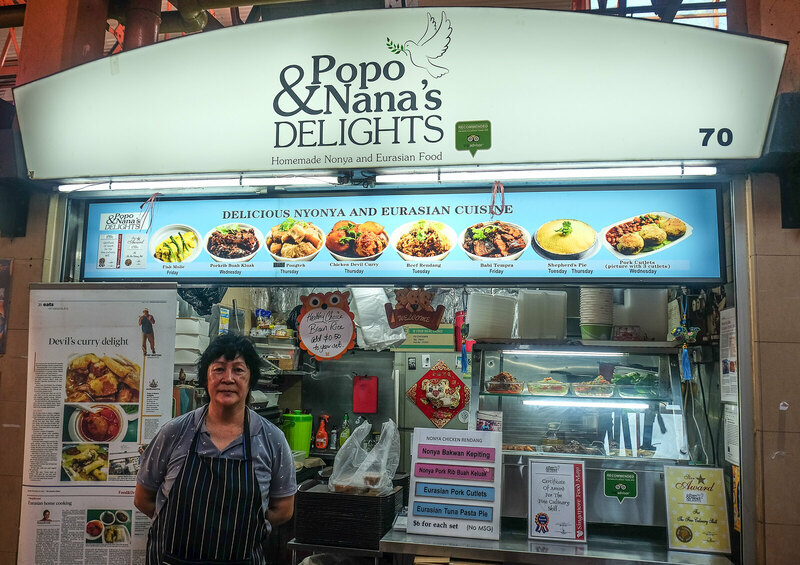 Inspired by her Popo (a stern Nonya grandma) and Nana (a loving Eurasian mum), Grace, the owner of Popo & Nana’s Delights, decided to be the first Eurasian and Peranakan hawker in Singapore. The past 4 years hadn’t been easy for Grace. After some experimentation, she concluded that running the stall on her own brings about the greatest efficacy. Well, that is truly commendable! Since she was young, Grace would observe her Popo cooking without asking many questions, because her Popo was an extremely strict Peranakan Nonya lady. Grace started the stall to recreate the dishes that her popo and nana used to cook when she was a child. She wants to share her memories and experiences with others through her food. Starting the day really early almost everyday, Grace prepares all her dishes before opening the stall officially at 11am. While she gets most of her ingredients from suppliers, she will specially head to the wet market to purchase beef each day. Note that the pictures below feature tasting portions. 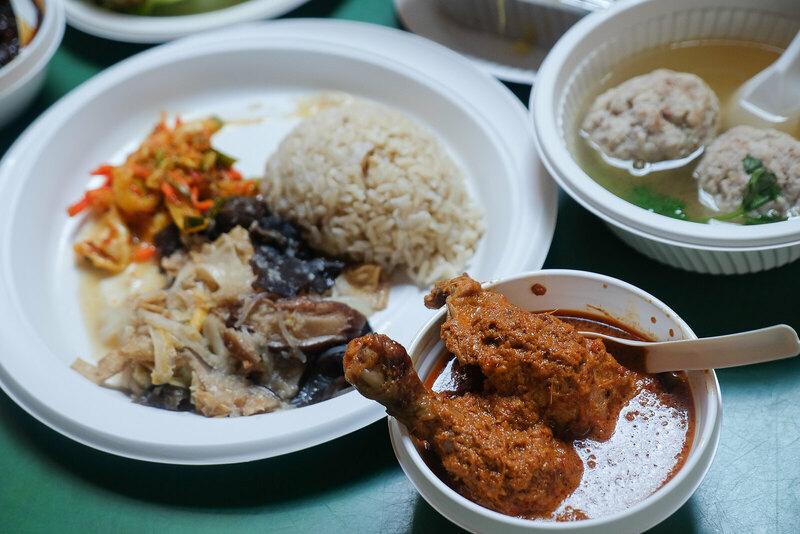 Each actual Nonya set comes with a funnel (literally) of rice or brown rice (additional $0.50), a choice of vegetables (Chap Chye, Achar or others), a choice of meat, and a complimentary bowl of soup of the day. For just $6, each set promises a decent portion of meat, and is especially satisfying. Popo & Nana’s Nonya Chicken Rendang was well marinated. Grace purchases her meats daily, thus, no frozen meat is ever used. Even the breast meat was moist and pretty tender. The sweet rendang sauce was addictive and paired really well with my delicious brown rice. By the way, Popo & Nana’s rice is scooped with a funnel. It is quite amusing, so be sure to catch Grace in action if you’re curious. 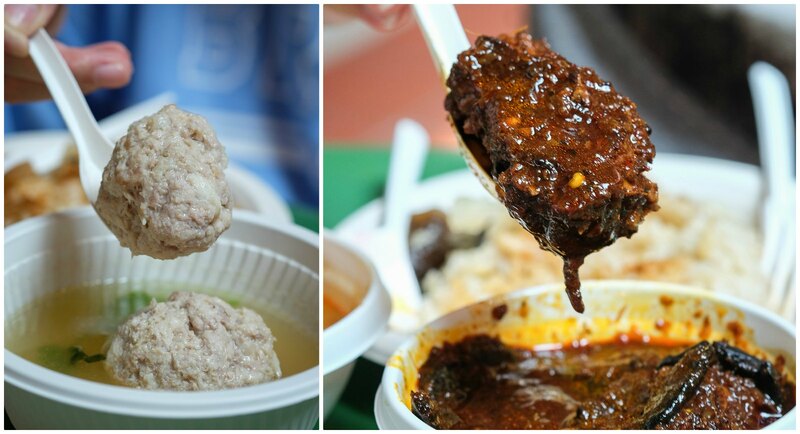 Handmade with fish paste, minced pork, bamboo shoot and crab meat, the Nonya Bakwan Kepiting was huge! I liked that the meatballs were firm and flavourful on their own. Don’t forget to dip them into the house-made sambal belachan! I also really enjoyed the light broth which was boiled with pork bones and fermented beans. 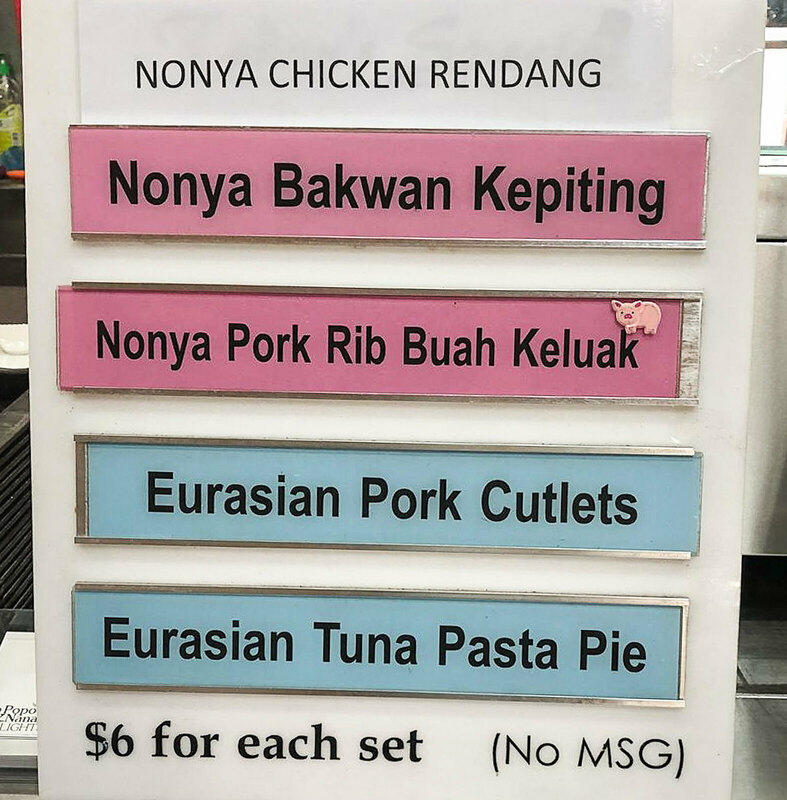 Nonya Pork Rib Buah Keluak was new to me. The dark pork ribs were immensely enticing, and my first ever taste of it made me go “wow”. I believe that not everyone will appreciate its taste, but my friend who has had Buah Keluak numerous times before said that this was above average! The tender pork ribs fell off the bone effortlessly. The medley of lemongrass, turmeric, fresh and dried red chili, onions and galangal gave the entire dish a lovely aroma that I fell head over heels in love with. Once again, handmade with minced pork, mashed potatoes and herbs, the Eurasian Pork Cutlets which were wonderfully crispy on the outside, were just a delight to tuck into. It may look simple but it’s the perfect finger food for me! The Tuna Pasta Pie was topped with a layer of melted cheese. The tangy creamy pasta within was mixed with broccoli, cauliflower, carrot, hard-boiled egg and heaps of tuna! The baked cheese just made everything even more yummy! Interestingly, Grace manages Popo and Nana’s Facebook page too! Thus, she posts her daily menu the day before to inform her followers and patrons what will be available the next day. Everything (even the beans, sauces, and pepper) that Grace uses is free of MSG and preservatives. Even her sambal belachan chili is made fresh every single day! 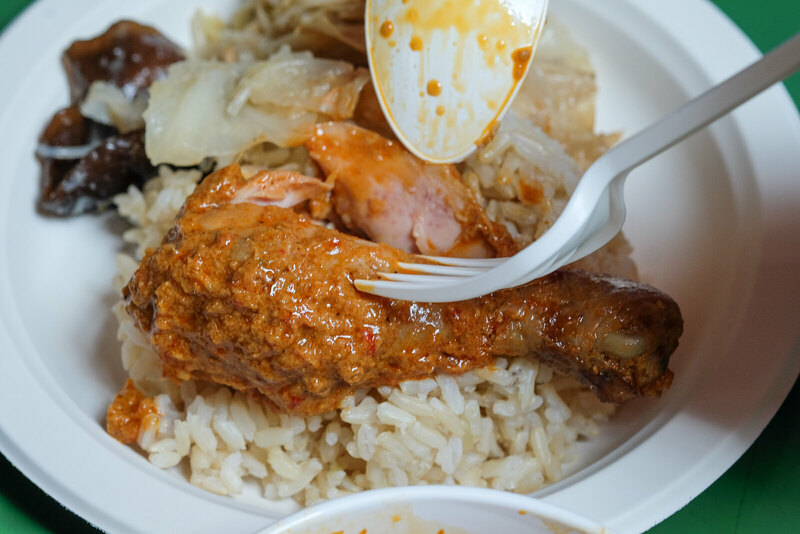 Sometimes, customers buy a small cup of sambal belachan from Grace for $6. And that’s if she has enough to serve for the day! She firmly believes in serving good quality and healthier food for her patrons. 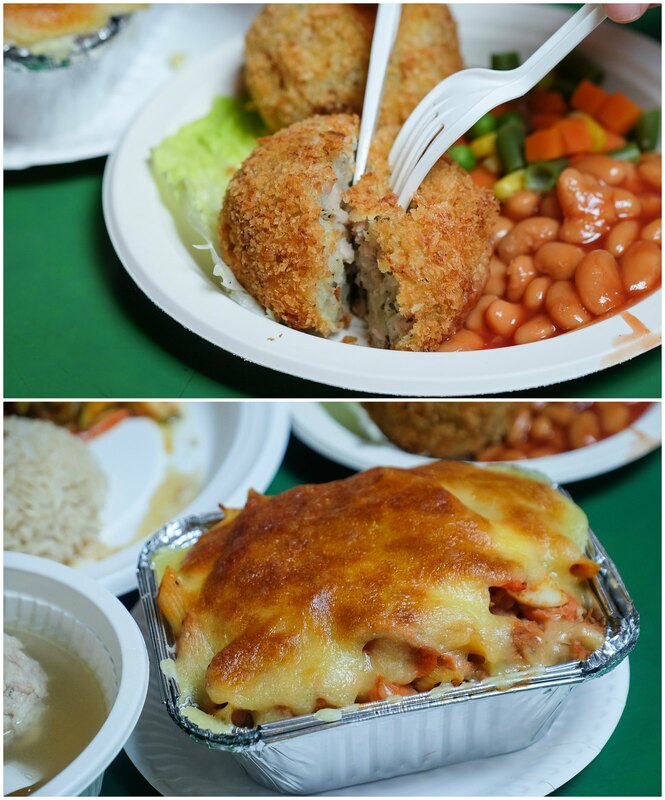 Popo & Nana’s Delights promises a taste of home! Opening Hours: 11am to 2:30pm daily. Closed on Fridays, Sundays and Public Holidays.